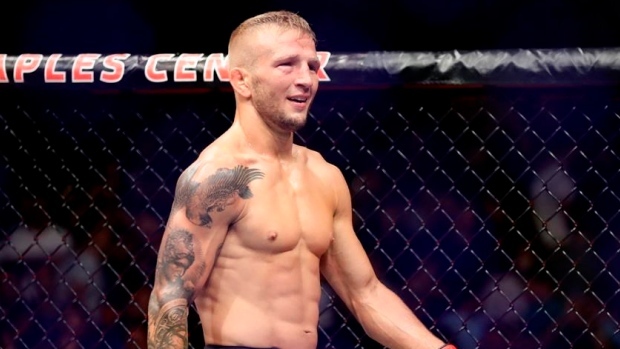 UFC bantamweight champion TJ Dillashaw announced on Instagram Wednesday he has voluntarily relinquished his title after being flagged by the USADA and the NYSAC for an “adverse finding” following his fight with Henry Cejudo in January. "To all my fans, I wanted to be the first one to let you know that USADA and the NYSAC have informed me of an adverse finding in a test taken for my last fight. While words can't even begin to express how disappointed I am at this time, please know that I'm working with my team to understand what has occurred and how to resolve this situation as quickly as possible. Out of fairness and respect to the rest of my division, I've informed the UFC that I'll be voluntarily relinquishing my title while I deal with this matter. I want to thank all of you in advance for the support." Dillashaw lost to Cejudo in January in his attempt to capture a second UFC title, this one in the flyweight division. The 33-year-old won the bantamweight belt in November 2017, defeating then-champion Cody Garbrandt, before successfully defending the title against Garbrandt in August 2018. Dillashaw has a professional record of 17-4-0.